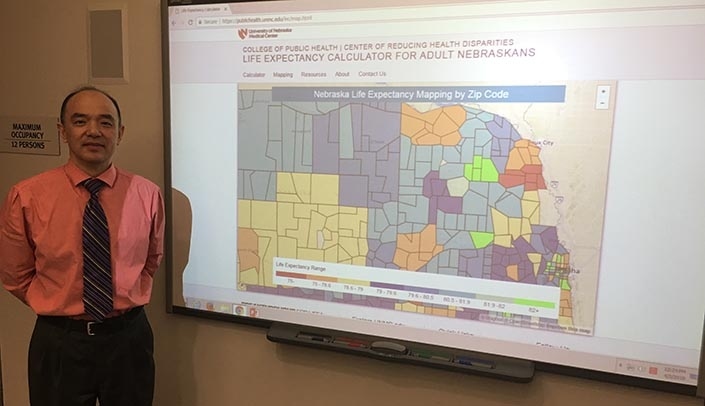 Dejun Su, Ph.D., displays the mapping tab on the Life Expectancy Calculator website that shows the average longevity of Nebraskans by zip code. Now there's a computer program that will tell you how long you can potentially live based on your demographics and how you can prolong your life if you make healthier choices. Dejun Su, Ph.D., associate professor and director, Center for Reducing Health Disparities, UNMC College of Public Health, led a team to develop the Life Expectancy Calculator and Mapping for Nebraskans program in the hopes that it will spur people to lead healthier lifestyles and prolong their lives. "It's a longevity estimate, but more importantly, it tells you what you can do to live longer," Dr. Su said. "For example, the calculator can estimate how many extra years a smoker can potentially live if he or she quits now." Ali S. Khan, M.D., M.P.H., dean of the College of Public Health, initiated the idea of developing the life expectancy calculator for Nebraskans. "The handy little tool is a creative way to serve the health needs of all Nebraskans by reminding us that a large portion of health is a choice. We hope the tool will help people make healthier choices and be outraged enough about the differences in life expectancy to get involved in their communities and champion solutions," Dr. Khan said. Dr. Su developed the prototype with the help of a computer science student from the University of Nebraska at Omaha who used this for her capstone project. Atul Rayamajhi, director of information systems in the College of Public Health, provided the needed IT support for this project. Estimates of life expectancy were based on 10-year population-based mortality data provided by the Nebraska Department of Health and Human Services. The algorithm predicts a person's life expectancy based on several factors -- age, gender, height, weight, race, home zip code, smoking status, amount of exercise and eating behavior. Dr. Su invites the UNMC community to try out the program and give him feedback and suggestions. Are you trying to type your info in? Instead, pull the blue dots in the bars below the measurements to the right, and that should increase the height and weight numbers. I am unable to enter my weight ,height, age, servings into your calculator. It has me at 1# and 1” What is wrong. This is such important work. Thank you, Dr. Su! Another purpose of this project is to highlight geographic disparities in longevity in Nebraska and mobilize resources and partnerships to address these disparities. Dr. Su would like to promote healthier living by providing a list of community resources available to help residents with various health needs. The Center for Reducing Health Disparities plans to host a community event 11:30 a.m. - 1 p.m., April 29 at the Wurdeman Learning Center, 5190 Sprague Plaza (Omaha Home for Boys), to enlist such agencies. A mapping tab on the website shows the average life expectancy of Nebraskans by zip code. The average life expectancy in U.S. is 76 years for men and 81 years for women. In Nebraska, depending on where you live, estimated life expectancy can range from 72 years to 90 years. "I want to increase public awareness of regional disparities in Nebraska and help direct resources and interventions to vulnerable, underserved communities where they are most needed to achieve better health equity," Dr. Su said. Email Dr. Su if you'd like to attend the event on April 29.